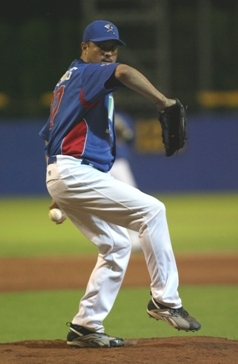 T&A San Marino has signed the 31-year-old right-handed pitcher Vicente Enrique “Henry” Bonilla as game-one starter for the upcoming season in the Italian Baseball League. He is replacing Horacio Estrada (picture) on the pitching staff, who is rehabbing an elbow injury and won’t be ready before the end of May according to a report by Baseball.it. Estrada had a 9-2 record with an ERA of 1.96 in 14 starts last regular season, striking out 79 in 91 2/3 innings (21 walks). Manager Doriano Bindi and San Marino hope that Bonilla can give them a similar performance every week. Born in San Salvador he grew up in North Carolina Reno, Nevada, attending Lassen Community College and Tulane University before he got selected by the Minnesota Twins organization in the eighth round of the 2000 amateur draft. He signed shortly after and made his professional debut in the Midwest League the same year. He stayed with the Twins organization until the end of the 2006 season reaching Triple-A. The past three years Bonilla has pitched in the Pacific Coast League for the Triple-A affiliates of the Los Angeles Angels (2007/2008) and the Los Angeles Dodgers (2009). Overall he had a 61-71 record with an ERA of 4.66 in 342 games (113 starts) through ten seasons of minor league ball. He picked up 628 strikeouts in 990 1/3 innings, walking 321. He would have been the first Major Leaguer, who was born in San Salvador. He grew up in Reno, NV not North Carolina. San Marino extends Duran, Bonilla. Bologna adds Sartori.